If Tiger Woods can make it to the 10th tee Friday morning, he’ll be part of a high-powered trio that figures to be the center of attention at the Deutsche Bank Championship. 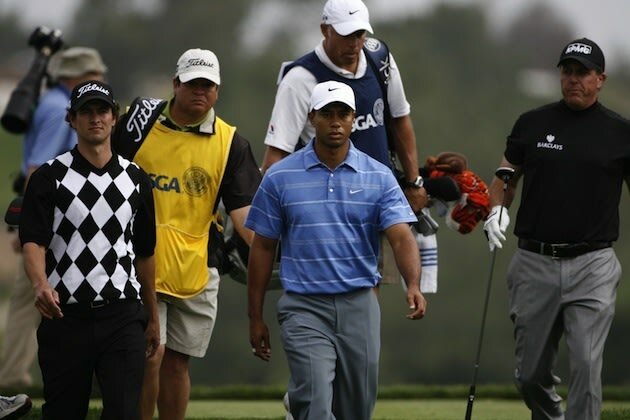 Woods is scheduled to tee off with Adam Scott and Phil Mickelson at 8:40 a.m. ET Friday (10 tee) and 1:10 p.m. (1 tee) Saturday at TPC Boston. They are Nos. 1, 2 and 3, respectively, in the latest FedEx Cup standings. Woods has a strong history at the 100-man event, which benefits his Tiger Woods Foundation. He has finished outside the top 11 only once in eight career starts, including a victory at TPC Boston in 2006. Last year, he finished solo third. Scott is coming off a victory at The Barclays, which further bolstered his Player of the Year hopes, and Mickelson roared into contention there with a final-round 65. Other groups of intrigue include the FedEx Cup’s 4-5-6 trio (1:10 p.m. Friday, 8:40 a.m. Saturday) of Matt Kuchar, Justin Rose and Brandt Snedeker. Kuchar and Rose, in particular, will have to recover quickly after Sunday disappointments at Liberty National. Kuchar shot a final-round 78 to plummet out of contention, while Rose missed a 5-foot par putt on the 72nd hole that would have put him in a playoff. Zach Johnson, who skipped the playoff opener to attend his brother’s wedding, returns to action this week in Boston. He’ll be paired the first two rounds with Harris English and Bubba Watson (8:28 a.m. Friday, 12:58 p.m. Saturday). Steve Stricker, at No. 28 in the standings, also makes his 2013 playoff debut after sitting out the opener. The 46-year-old has thrived in his first year of semi-retirement, and hasn’t finished worse than 12th in his last four starts. For the first two rounds at TPC Boston he’ll be grouped with Charl Schwartzel and Jimmy Walker (12:58 p.m. Friday, 8:28 a.m. Saturday). My bets are on TW this time. Knock against him:While Woods has had by far his best season since 2009, he still wasn't able to end his drought in major championships. That goose egg has left the door open for others. it's gonna be great to watch adam scott, tiger woods and phil mickelson get paired together.. hope tiger's back gets better by then! Bro Daz, u watching online now? Which link? wow, what a round by phil!! exciting golf, but looks like he's continuing his strong play from sunday at the barclays! it's gonna be a good tournament !! Any link to watch online? I was expecting this man to win after his consistent play over the last few tournaments. Congratulations to Henrik for a deserving win. FX Cup points . Congrats! Yes, his time has come ... He finished 2nd at the 2013 Open Championship, another runner up at World Golf Championship-Bridgestone Invitational and finished 3rd at the PGA Championship ... Awesome feat!